Thanks for the heads-up about this from a couple of the readers of this site. 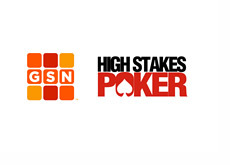 The ninth episode of "High Stakes Poker" has leaked to the Internet a few days early - apparently GSN accidently uploaded the wrong episode to Youtube. The videos will likely be pulled down from Youtube fairly quickly, however we managed to view them and will provide a quick overview of the episode. There are obviously spoilers in this article, so if you don't want to know what happens, then don't read any further. The first hand involves Sam Simon. He limps with pocket Aces, and a couple of other people see the flop as well. Esfandiari leads out with a bet (holding nothing) after the flop brings two Kings, Simon raises with his pocket Aces, and Esfandiari elects to fold. On the very next hand, Simon again decides to limp, this time with A-Q offsuit. Simon's limping comes back to bite him in this hand, as his top pair (A-Q) is no good on a board of A-2-8-6-5. Unfortunately for Simon, Antonius flopped two pair (A-2). Simon calls a $37,000 bet from Antonius on the river, and Antonius is shipped the $128,000 pot. After these two hands, Simon elects to leave the game. Phil Laak wins the next couple of hands in smallish pots, one against Patrik Antonius, and one against Antonio Esfandiari. Tom "durrrr" Dwan sits at this point, and elects to buy in for $500,000. The next big hand takes place between Phil Laak and Patrik Antonius. Laak raises pre-flop holding A-J. Howard Lederer calls with 8-8, and Antonius elects to call (he was the straddle in the hand) with 10-4 of spades. The flop comes 3-2-4 with two hearts. Antonius checks, Laak bets $16,000, Lederer folds, Antonius calls. The turn is the King of spades. Antonius checks, Laak bets $37,300, Antonius calls. The river is the Queen of diamonds. Antonius checks yet again, Laak fires out a bet of $80,000, and Antonius makes the incredible call (just a pair of fours) after some thought, and rakes in the $287,400 pot. The table is stunned after this call. The last hand of the episode is the "baffling" hand between Dwan and Lederer that was hyped up on the last episode. Lederer raises to $3,500 pre-flop with the A-K of diamonds. "durrrr" raises to $11,300 with 8-6 offsuit. Lederer puts in another raise, this time to $36,300. "durrrrr" four-bets to $65,600. Lederer elects to call. The flop comes 3-2-Q. Both players check. The turn is the 8 of hearts, giving Dwan a pair of eights. Both players check again. The river is the 9 of diamonds, and both players check once again. Dwan shows his pair of eights to take down the sizable pot, much to the dismay of Howard Lederer. The table is in shock once again. Daniel Negreanu chimes in with a "You just got durrrred" as Howard looks on with a mixture of amazement and disgust. This hand wraps up the episode. The preview for the next episode hypes a showdown between Dwan and Antonius.